The idea of a basic income - it's generally referred to as a Guaranteed Annual Income in Canada - has been floated again. My initial reaction was that this is such a good idea that it's hard to figure out why we don't have it already. For some reason, there doesn't seem to much in the way of a formal modeling exercises that work through the general equilibrium implications of a BI (I will be happy to be corrected on this point), so I decided to set up a blog-sized version. It turns out that although the BI is still a good idea, it's not quite the slam-dunk I thought it was. The gory details are below the fold. The employment rate increased to 63.8%, yet another new record. The private sector was the source of employment growth, reversing the last few months' worrying trend in which jobs were mainly being created in the public sector. 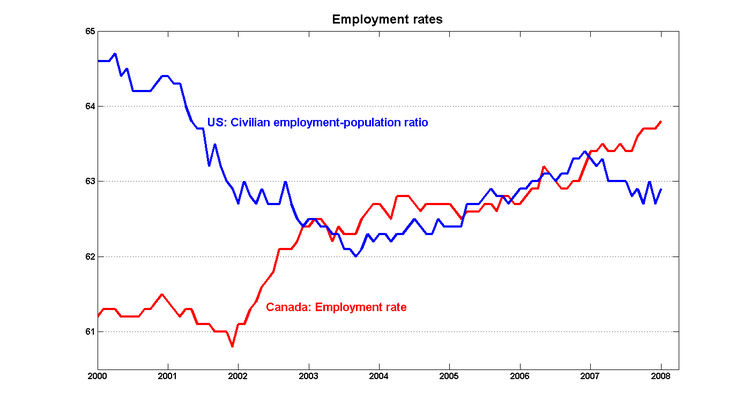 If Canadian employment levels hold steady while those in the US fell, it would be for the second time in a row. Should we be worrying about a 'Carney put'? I remain unconvinced that investment bankers should be running the central bank. Now, I don't have a pathological hatred that most of them will likely earn more than I ever will if I end up in academia. But I remain unconvinced that anyone who is fundamentally part of the investment community should be running the BoC. Maybe I should justify this belief? I'll give it a shot. The investment community is a very small part of the real economy. Yes, financial services are the biggest things in the economy, by market-cap, TSX weight, or whatever. And yes, I'm pretty sure a lot of banks add to the bottom line by playing with exotic trading instruments, but their fundemental strength is derived from the average Canadian who is happy with low-cost index funds and fixed income. It seems that most investment types take this sort of news poorly. I mean, looking at the American whining to rescue equity markets - whining which was indeed sated. Slate has a good article on this: The toddlers who are running the global economy. There is no law that says speculative losses will derail the economy, and I don't think they can, really. Now, I'm pretty sure even if there come times when Carney caters to the TSX more than I'd personally care for, this doesn't mean the big bad seventies are coming back. By no means. But I'd much prefer someone who can push an agenda I think would be much more profitable in the long run than bailing out Bay Street; things like the stability of the time-path of prices. This is something worth thinking about. An important part of the Bank of Canada's accumulated stock of inflation-fighting credibility has been based on the flinching certainty that it will not cut interest rates in order to provide a floor for stock prices. When the Bank was being run by career civil servants, this sort of focus was relatively easy to maintain: the decision-makers simply didn't care if they were personally popular on Bay Street. Or anywhere else, for that matter: John Crow is a case in point. Carney's familiarity with financial markets is his strongest asset in his new job; the Bank's major challenges over the next few years are likely to involve trying to avoid such things as the subprime meltdown. But he's only 42, and he may be entertaining the possibility of returning to the private sector after his mandate as Governor. One of the (many!) problems associated with living next to the US is the potential for confusing their problems with ours. The state of the housing market is a case in point. (I particularly like this graph because I was able to preserve the 'rule of ten' correction for comparing US and Canadian numbers on the vertical axis). 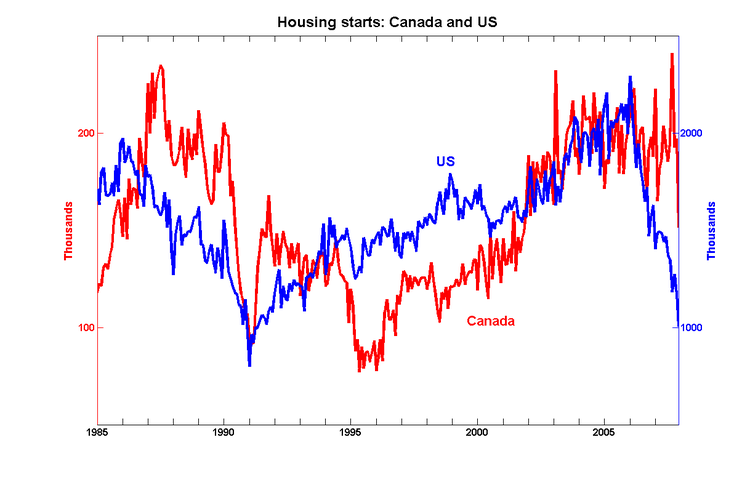 Although housing starts in the US have been falling over the past two years, they've held pretty steady up here. That last observation looks a bit worrying, but it appears that there's an explanation: December was an exceptionally bad month for winter weather. Although the value of new permits is still off its peak, there's still no sign of a US-style meltdown.